It's the first ZR-1 droptop since 1970. Set to go on sale next spring alongside its coupe counterpart, Chevrolet has unveiled the 2019 Corvette ZR-1 convertible at this year’s LA Auto Show. For those who are unaware, this is the since the original 1970 ZR-1. 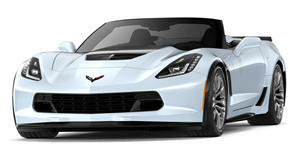 In terms of performance and overall capabilities, the ZR-1 convertible matches the coupe. Because of the aluminum chassis, the only structural changes are a result of the folding top and repositioned safety belt mounts. For those concerned about weight, don’t: The convertible weighs just 60 lbs more than the coupe. The power top can also be operated up to speeds of 30 mph. With a top speed of 212 mph, the ZL-1 coupe and convertible are powered by the new LT5 6.2-liter supercharged V8 with 755 hp and 715 lb-ft of torque. When equipped with the eight-speed automatic transmission with paddle shifters instead of the seven-speed manual, Chevrolet believes the ZR-1 can make the 0-60 mph sprint in less than 3 seconds, and the quarter-mile in the high 10-second range. The while the convertible begins at $123,992, including all destination fees but excluding tax and, sadly, potential dealership mark ups.